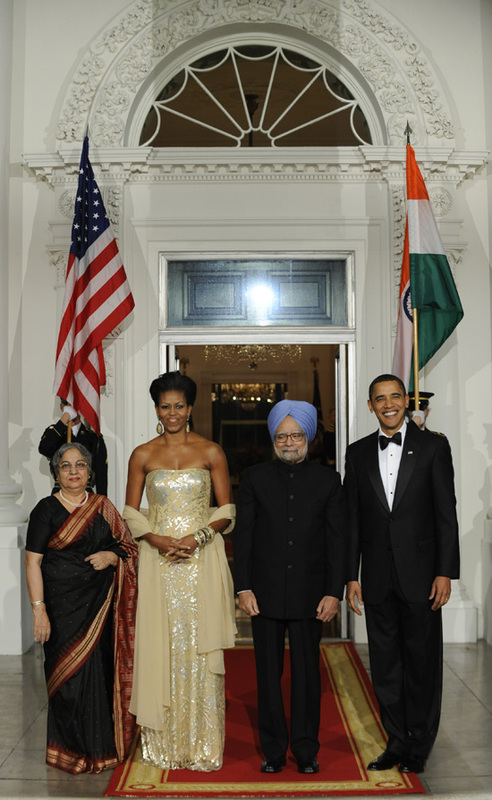 Michelle Obama looked dazzling in a sleeveless gold dress and shawl as she and President Obama welcome Prime Minister Manmohan Singh and his wife Mrs. Gursharan Kaur for the first official state dinner on Tuesday night. Mrs. Obama's dress was designed by Indian-American designer Naeem Khan. Check out our State Dinner Big News page! Pool was brought into the Grand Foyer at 7:17 p.m., after Prime Minister Singh and his wife, Gursharan Kaur arrived and were greeted by POTUS and FLOTUS on the North Portico (this was open press). As pool waited in the Grand Foyer, the Marine Orchestra filled the room with music, including John Rutter's Suite for Strings (the first one) and a number called Fascinatin Rhythm, which sounded it had a touch of New Orleans in it. Your pooler could hear laughter and chatter coming from at the top of the Grand Staircase - although not enough to make out what anyone said. A fire burned in a fireplace in the Green Room. 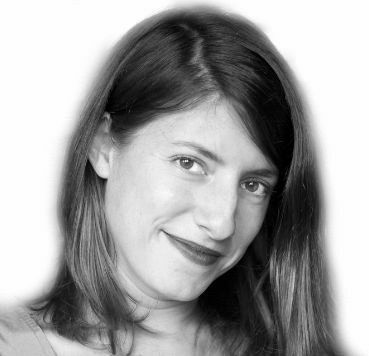 White House staff and Secret Service were shuttling around in tuxedos and floor-length ball gowns. Speaking of which, FLOTUS is wearing a strapless, floor-length, champagne-colored gown with silver detail by designer Indian-born designer Naeem Khan. Her hair is swept back and she is also wearing a bunch of churis, traditional sparkly Indian bangle bracelets. Kaur was wearing a black sari with red and gold trim. At 7:37 p.m., some administration officials made their way down the Grand Staircase. Secretary Clinton was first, accompanied by someone your pooler did not recognize, following behind were Gen. Jim Jones, Vice President Joe Biden and his wife Jill Biden - who is wearing a gown by Lebanese designer Reem Acra - and Ambassador Rice, Ambassador Timothy Roemer. They all two-by-two walked into the Green Room. Around 7:45 p.m. POTUS, FLOTUS, Singh and Kaur made their way down the red carpet lining Cross Hall. They came from the west side. The four of them stood in front of the doors to the Blue Room - from right to left: POTUS, Singh, FLOTUS, Kaur. POTUS and FLOTUS flashed broad smiles as the cameras rolled and photographers clicked, while Singh and Kaur were more plain-faced. They four of them then turned and entered the Blue Room. Pool is now holding in the press file, waiting to be taken to the tent for toasts. Want more Michelle Obama style? Visit the Michelle Obama Style Big News page.